The meaning of the Six of Swords is that you are experiencing a transition of some kind, but one that is not happy and filled with regret. This transition will most likely be the result of decisions you made in the past, and now they are forcing you to leave something behind in order to move forward. Despite your sadness, you need to remember that moving on is the ideal option for your future. Despite your sadness, you need to remember that moving on is the ideal option for your future. Life is filled with moments when you are going to be forced into letting go of things that you have become attached to. This will be challenging. The Six of Swords shows the sadness that you may be feeling, but you have to remember that the pain will not last, so you should look instead to the future for strength. In life, there will be times that the only way to fix a problem is to leave it and move to start anew. You may feel like this is the coward s way out, but escape is the only approach that is left when you have tried all other methods. The important part is to plot your new course that will lead you to happiness. The Six of Swords in this case, is to plan using your logic, clarity, and objectivity about where you are now, where you have been and where you want to go. Intuition can help, but you need to think logically to ensure your success. 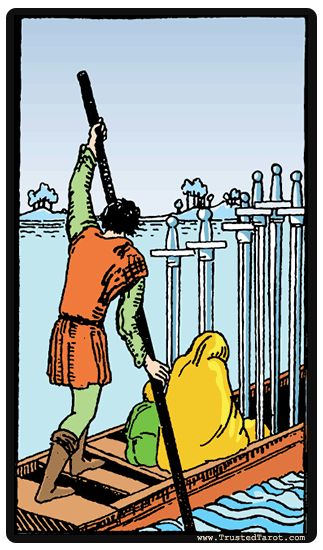 The Six of Swords reversed can indicate that you have been trying to move on and make the transitions you need. However, you may be experiencing challenges making these a reality. You may keep returning to the past, whether it's because there are issues that are not resolved, or you are questioning your decisions. Another Six of Swords reversal meaning is that you have been resisting the transitions that life is giving you. You may feel that you are being forced into making moves before you wanted to or you do not want to move at all. In this case, you should think about the benefits of the moves, instead of the drawbacks. Like Orpheus in the underworld, you must only look ahead and not backwards, for if you do look backwards, you risk falling apart.